(*) I've only found 1 user with so high vocabulary size. Please, take into account that some trees have A/B tests, so maybe you cannot get the full count at the moment. OTOH, maybe you have to buy the bonus to get the full vocabulary of the course. If somebody knows it, please tell. If I committed a mistake or typo, or another language or course is missing, please also tell to add or correct the info. Thanks again to FieryCat for this new trick. Also, isn't it odd that the most widely used course (Spanish, now with counting over a 100 million registered users) has such a small vocabulary? Yes, the Spanish vocabulary was set in stone long time ago, and I don't see any interest from Duolingo in improving the course. The only difference between users is that some have done bonus lessons and some not, and this only accounts for about 15 lexemes. There have actually been two dramatic updates to the course since Spanish was originally released years ago. The updates come every so often. Thanks for your interesting info! Keep in mind that I cannot know very old vocabulary changes, because I've only tracked very active users (plus a few users that have finished a tree recently) and they tend to keep updated the popular languages. I wrote and ran a small script to analize maximum vocabulary size (base language English) for the users from this list (994 users): Streak Hall of Fame Sign Ups. As soon as the data appears, I will publish them in order to compare. Wow, this is amazing!!! Could you select users with other base languages? I'm specially interested in getting the vocabulary sizes of the different courses on Duolingo to teach English, but it's sooo hard to get these data!! Incredible. Thank you for the information. Wow, astonishing data!! Thanks a lot! :D :D However, you added another mysterious number, the finished part. How do you know this number?? There is another trick, which allows to get a lot of useful data about a user: https://www.duolingo.com/users/user_name_here. This data contains information about the the course that the user is learning now. Aha, I Knew that, that link has very cool info. 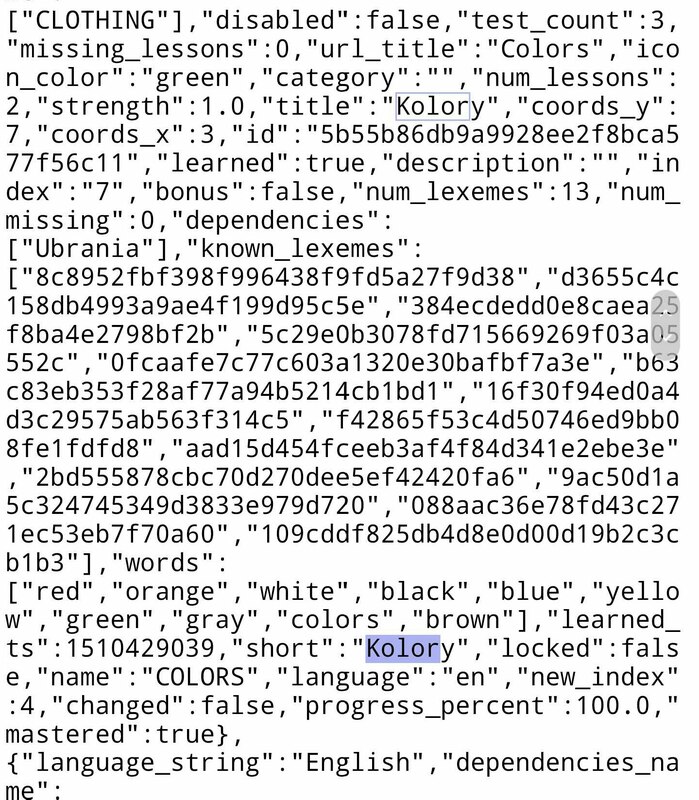 One hidden information I very much like to see are the individual streaks, you have one for every language... That way you can see what languages one user is currently working on, or you can know how many streak days you have with a certain tree or trees. The long number is your user_id, and by hand it's a lot faster to get it from there using the Right Mouse Button (Over the avatar, in Chrome click "Open image in new tab"), than from the usual link https://www.duolingo.com/users/user_name_here. OTOH I think you should publish your data in a post yourself (if you haven't done yet), as they are much more complete that mine. With my manual method I can get my info quite easily from my best users, but only for the English courses. Again, thank you very much for your info. Now maybe I select one course instead of other based on tree size, and while I'm advancing in my current trees, I'm looking forward to confirming the full vocabulary sizes. Most likely, "my" user has not finished his tree. I did not check that in my script. It is necessary to add such a check in the script or display the percentage of completion of the tree. In fact, this information should be collected in all forums and not only in one thread. Yeah, this is a very difficult course to have finished because it was released very recently. The kind of users you checked are juggling 20+ trees, so unless they have previous Knowledge of Korean, it's really difficult to complete that tree in no time. I found another user with a 1579 count for Guaraní. For some reason the method didn't work for a few other people whom I know to have finished the tree, however (ah, b/c I assume their accounts weren't set to Spanish base language at the relevant moment; mine wasn't either just now, but I guess it can be easier to check oneself). Thanks. Could you tell me what kind of data you are interested in? In a few days, if I will have a spare time, I would updated my script and shared the data that you need. The script is already working but I can edit it later. The script will tell me how many users from that list were from English language. I think that there will be the majority of them. I don't understand why 2 people have downvoted you! Maybe it's the word "script" what has triggered an irrational response IMO. If we didn't have scripts, programs, or computer science in general, we wouldn't have Duolingo in the first place, this wonderful tool to help you learn foreign languages. No, It was my personal "fan". It seems he has finally discovered for himself the English branch of the forum :D Never mind. Do you know that the parameter "language" can have value "all"? Wow, I had no idea!! Now you can do your personal total tally way easier than before! I appended an update to the post, including your info. Take a look at this user: "Olja. ", she has total 444701 XP. whereas Olja. has an outstanding total of 34376. 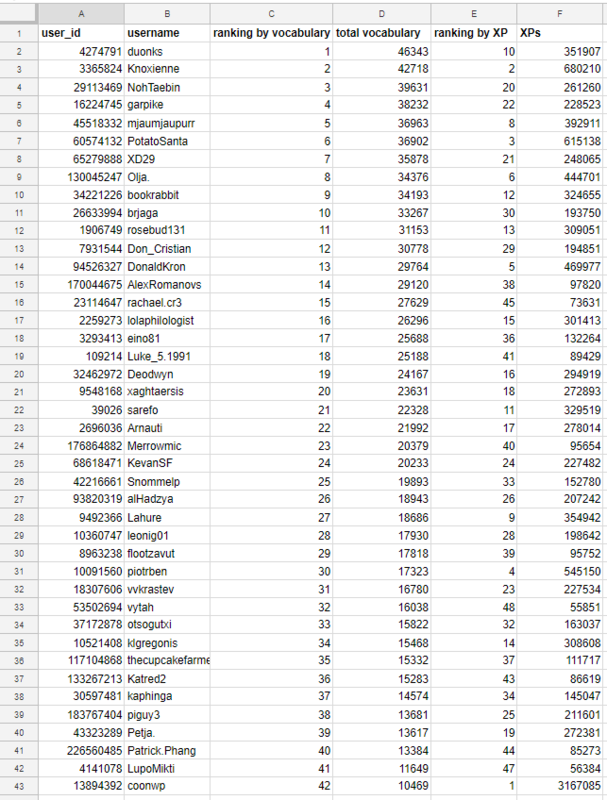 Note that my ranking is not exhaustive, it's only from users I follow. Another observation is that after doing my vocabulary research, XPs has become rather meaningless for me. As far as I know, best duolingers has around half million points. Those who are in the millions, they usually go for very few languages, and I don't know if they are truely learning them. For me it's absurd to constantly review the same 2,000-2,500 lexemes... If you want to be fluent, maybe you need 10,000+ lexemes, and a further immersion in the language that Duolingo doesn't provide currently. Those high single-language totals are generally from Immersion; I think that's usually the case for any number substantially above around 40,000. Yes, you are right, but if an user for example has Spanish, German, French and English, all of them with +500,000XP and no exotic language, I find them boring. And if they have a difficult language, most of them don't have finished the tree!! Whereas, users with less than 1,000,000XP I found that they usually study their languages. I don't say anything about keeping the trees gold, I'm only talking about finishing trees, because I cannot know if they keep them golden, or if they complement Duolingo with other resources. How do you use the trick when you have more than one course into a target language? For instance, I have two for French but if my account is set to a third base language, I get a "0" for "fr". Aha, if you have for instance these 3 hypothetical courses "fr from en", "fr from es", "fr from it", you should change your base language to English, then to Spanish, and then to Italian, to get the respective tallies. Or easier, I think if you change manually to those courses, you should get the tallies. Play around, and you should get all your tallies from all your base languages. Good luck, and feel free to ask for help if you get into a dead-end. Yeeeeeees. Bro I love spreadsheets, you're an angel. Thanks, I've added the Chinese count to the list. If you have a way to check, I currently have my Golden owls in the English for Portuguese Speakers, English for Dutch Speakers, and English for Italian Speakers. I used to have English for Spanish Speakers but they have extended that tree and I haven't got around to finishing the new lessons. I have a few trees like that; I have finished 20 different trees (some more than once) but some have been expanded and I haven't finished the new material, like Dutch and Norwegian for English Speakers. I also have golden owls for [Portuguese, Catalan and French] for Spanish Speakers and Spanish for Portuguese Speakers. Mmm, I can only access one course of English of yours (provided you do NOT have English as your base language). For example, if your primary language is Portuguese, I could get only the vocabulary size of the English from Portuguese course. If your base language is Italian, the number from the English from Italian course and so on. I think I am going to look for your id, and then you yourself can look for all the numbers you want. You can add \&language=en to the link to change the languages. But the easiest way in your case, it's that you change manually to all the courses you want to know your current vocabulary size. One of these days I will re-finish my English for Spanish Speakers tree. I will do several other ladders too, someday. Many thanks, I've updated the vocabulary table with your info. Ok, your current vocabulary size for Norwegian is 3140, and for your Italian is 1808 (and I could go on and on looking for all your courses from English). For your English I get a 0, because right now you have English as your base language! Very interesting Carlos! I got my user I.D> 3332448. Can you tell me where I would rank in your Hall of Fame? I was pleased to see six of my friends there. You were included with 10920 words in the Bronze 10k+ group. I think this is good news. Now, for absolutely everything you can get in Duolingo, there's a special ranking... :-) I was specially motivated for owls and lingots, but now I would also like to increase my global vocabulary (well, actually these are only side motivations, my main one is to improve my main languages, and to explore the rest of them). Sorry, but you wouldn't rank at all in my HoF, because it's made by hand using the Google docs spreadsheet and special links, and controlling over 50 users is no longer fun for me. At this right moment it would be required to have over 30,000 lexemes only from the English courses ( I can't control the lexemes gotten from the rest of base languages because it would be too time consuming). The HoF words ranking appears to include courses from all base languages, so probably contains a lot of repeated vocabulary, especially from English, Spanish and French-from-XYZ courses. I think your ranking only from English courses is rather more scientific. I haven't thought of that, but I think you're absolutely right. In a sense the two rankings would be complementary... At the moment I'll wait, maybe the author of the page will make separate vocabulary rankings for every major language. maybe the author of the page will make separate vocabulary rankings for every major language. This is terrific info! So if people want the complete vocabulary for Ukrainian and Turkish, they must buy all the bonus skills!! :-) That explains the tiny difference between some users and others. There are ones that usually buy the bonus lessons, and others than not. Having completed all Ukrainian bonus skills, my word count is, indeed, 1127. You may add my data directly in your post, if you want. I've been wondering for some time how many actual word roots are in the courses, as I noticed that declinated forms are considered a separate word. Good example is Esperanto: there were originally only 900 word roots (modern vocabulary got greatly expanded, it has already been more than doubled), but the word list gives a much higher number. Just checked my own lexemes count for all the languages (from en, pl and jp) and was greatly suprised... a total of 11095! That's about 138 new words a day. How and when did I learn that?! Thanks for the lexeme count info, I've updated the post. Regarding the "Words tab", I don't know any special trick, apart of trying to make the link by hand: www.duolingo.com/words, but if there wasn't a tab, I think I've always found the 404 error. Anyway I'm not much interested in learning isolated words, as I'm much interested in learning the grammatical structures by practicing them. If a forget a word I don't worry, if it's important eventually I'll will learn it. And about mobile Duolingo, sorry, I don't have a smartphone (only an old mobile without internet), so I only use the web version. English from Ukrainian also has 1397. The to-English trees I've done all share this count it seems. I think they're the same words and in the same skills, although the sentences do seem to differ. Updated Ukranian and 2 English trees info. Yes, I think that the English from Slavic languages trees share all the same vocabulary, that must be very similar to the rest of English trees, except the English for Spanish speakers tree which is clearly an outlier. Thank you for the reply, nonetheless :) I found an easier way to find out user's id - find on site "distinct_id", there should be only one. At least it is for my /users/nicknamehere site. Over the user's avatar image, right click, and then click on "Inspect"
(*) you need Chrome, and that the user has a custom avatar. Use the method that best suits to you. Thanks for the tips! I'm mainly on mobile now, unless I post longer discussions, so I mostly operate on modifying links. https://www.duolingo.com/vocabularies/size?language=all : this also works for seeing own lexeme count in languages using currently used display language, without knowing one's own id. Those are cool little tricks! I've normally gone to the users page and then just done Ctrl-f for "user_id". The new tabs one does seem marginally speedier. I was thinking if it's possible to get the user_name from the user_id. Yes, it is possible. This link will always point out to your account by your user_id. What I would most like to know is the vocabulary one can obtain from doing every tree involving a language, in both directions. I have learned lots more Russian and French vocabulary, for example, by getting French from Russian up to level 20. A measure of how many lexemes this has added to the base I got from the from English courses would be very interesting. The method here is accessing something from the structure of the tree as laid out in the Incubator. I have a suspicion for myself that the lexemes here might not actually be fully unique, for instance if verb forms are introduced before the point in the tree at which all forms of e.g. present simple regular verbs are considered known based on the introduction of any single form. Maybe e.g. subjunctive also has to be entered as a separate "lexeme" so that just by learning indicative forms the system isn't automatically assuming you actually know subjunctive, too. Otherwise stated, a lexeme in the target language is a certain kind of structure that contributors have to set up in the Incubator. The system has a way to count them, and that's what's being displayed using this method. The base language for the tree, however, is just whatever is needed to translate sentences put together with these lexemes. I don't think there would be any built-in way to measure the content of the base-language sentences. Anyway I don't mind an error of +-50 lexemes, as my first intent was to have an idea of how large are the different trees in Duolingo. Plus IMO no matter how well you learn the respective vocabularies, it's clear that there will be always thousands of remaining native words to learn if you want to achieve a high level in a language in the real world. From the interface I only obtain lexeme counts. If I could obtain the actual lists of lexemes of every tree, it would be easy for me to merge lists, eliminate duplicated lexemes and find out how many new lexemes you get with a reversed tree, or another combination of trees. Maybe this kind of info is only accessible by the staff. Incubators must have access to the lexeme list of their own tree, but I highly doubt they can have direct access to other trees, for security reasons. 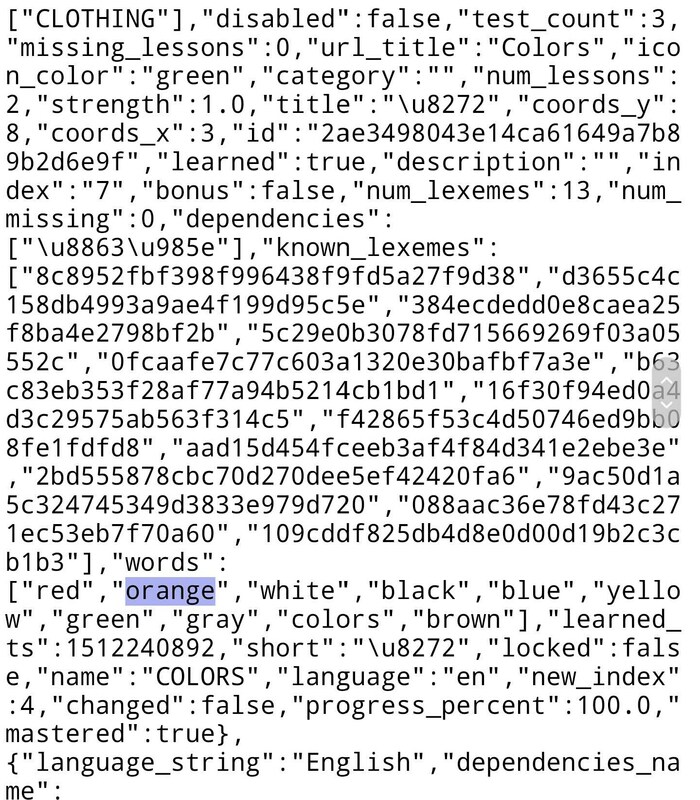 Look under "known_lexemes", each appears to have it's own id assigned. 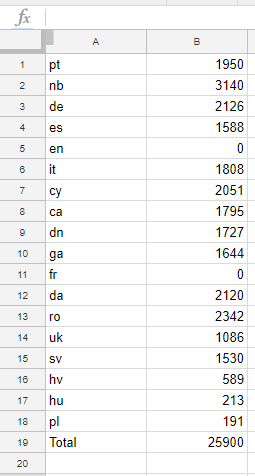 You'd have to use the text from users who actually completed the tree and it shows only for the language currently used (checked switching between Esperanto and Japanese, because I completed those two), but maybe it would be possible to compare those numbers and eliminate duplicate ones to get more accurate lexeme count? The ids' amount is the same as the number of listed lexemes taught. Also, they may have the same id's between different courses teaching the same language, which would make it possible to eliminate duplicates is someone learns, for example, English from multiple languages. It looks like the id's are shared across courses teaching the same language at least in certain instances. There are also some of the words taught themselves (Ctrl-f for "words" with the quotation marks), but it looks like only ten per skill no matter how many lexemes are taught. I don't remember what was the problem, but I wasn't able to figure out the total lexeme count from the known lexemes ids. Maybe it was simply too much work for me. You might keep investigating on this if you feel like. Anyway, in this year my intention is only to work on my "Hall of Fame based on total vocabularies", as it is relatively easy for me to get the data, but I would probably raise the bar to 20,000 or 25,000 lexemes of total vocabulary for courses based on English. The ids' amount is the same as the number of listed lexemes taught. On a skill-by-skill basis this is true. However, it may bear noting that the total lexeme count for a course is distinct from the sum of "num_lexemes" figures. For example, in English from Dutch the course total is 1397, but the sum of the skill lexeme counts is 1952, which is even a couple hundred more than the total listed my the Words list for the course at the moment. 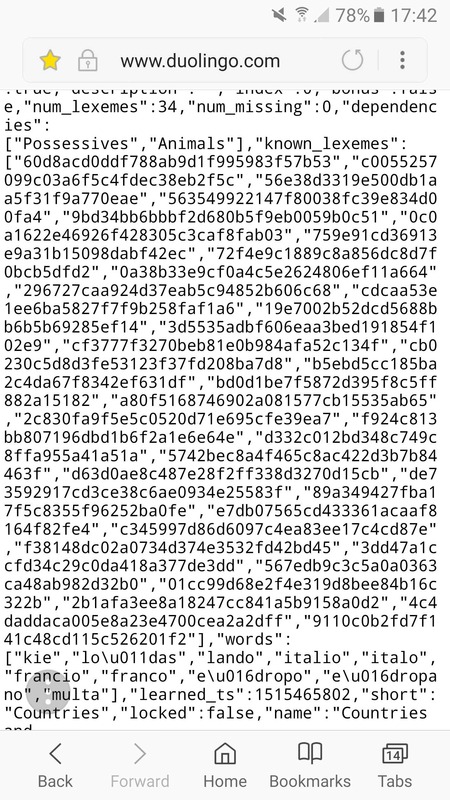 I meant only the section count and the amount of the "xyz" ids listed in it. Thanks for the notice though! If I have time, I'll take a closer look at this. It's probable that some lexemes appear in multiple skill sections. I was thinking of something among the lines of copying the ids and then running a duplicate test on it, removing duplicates and checking how the count compares to the count for course total. Yes, there must be a lot of duplicates. However I think that the real problem is that the ids are from distinct words, not from lexemes. I vaguely remember something like that, from the work I did here 4 months ago. It looks like there are even separate id's for homonyms at least. For instance, the word "one" appears in both the Numbers skill and the Determiners skill. However, none of the id numbers from the Determiners skill is occurs more than once on the page.